(Nanowerk News) Transistors, as used in billions on every computer chip, are nowadays based on semiconductor-type materials, usually silicon. As the demands for computer chips in laptops, tablets and smartphones continue to rise, new possibilities are being sought out to fabricate them inexpensively, energy-saving and flexibly. The group led by Dr. Christian Klinke has now succeeded in producing transistors based on a completely different principle. They use metal nanoparticles which are so small that they no longer show their metallic character under current flow but exhibit an energy gap caused by the Coulomb repulsion of the electrons among one another. Via a controlling voltage, this gap can be shifted energetically and the current can thus be switched on and off as desired. In contrast to previous similar approaches, the nanoparticles are not deposited as individual structures, rendering the production very complex and the properties of the corresponding components unreliable, but, instead, they are deposited as thin films with a height of only one layer of nanoparticles. Employing this method, the electrical characteristics of the devices become adjustable and almost identical. These Coulomb transistors have three main advantages that make them interesting for commercial applications: The synthesis of metal nanoparticles by colloidal chemistry is very well controllable and scalable. It provides very small nanocrystals that can be stored in solvents and are easy to process. The Langmuir-Blodgett deposition method provides high-quality monolayered films and can also be implemented on an industrial scale. Therefore, this approach enables the use of standard lithography methods for the design of the components and the integration into electrical circuits, which renders the devices inexpensive, flexible, and industry-compatible. 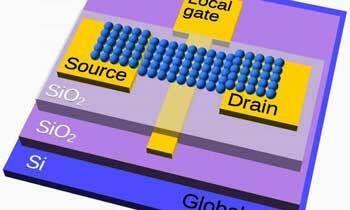 The resulting transistors show a switching behavior of more than 90% and function up to room temperature. As a result, inexpensive transistors and computer chips with lower power consumption are possible in the future. The research results have now been published in the scientific journal Science Advances ("Metal nanoparticle film–based room temperature Coulomb transistor"). 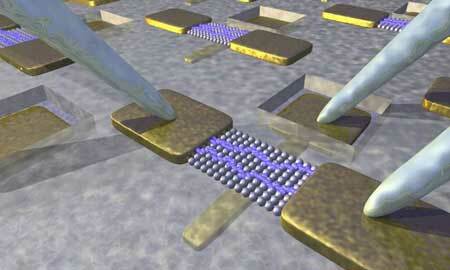 "Scientifically interesting is that the metal particles inherit semiconductor-like properties due to their small size. Of course, there is still a lot of research to be done, but our work shows that there are alternatives to traditional transistor concepts that can be used in the future in various fields of application", says Christian Klinke. "The devices developed in our group can not only be used as transistors, but they are also very interesting as chemical sensors because the interstices between the nanoparticles, which act as so-called tunnel barriers, react highly sensitive to chemical deposits."